With the kids back to school and homework starting I sometimes find myself looking for shortcuts when it comes to making dinner. Some nights we are just so pressed for time. Whether they are pre-made or I made them and froze them, I always have chicken tenders or nuggets on hand in the freezer. I always try to make my own and freeze them but sometimes the frozen bag has to work. They really do make life easier sometimes. Again everything tastes better with cheese and these right here just got kicked way up a notch! Why just dunk plain old breaded chicken in sauce when you can have all these good fixings with it to. Place chicken on a large rimmed baking sheet and cook chicken according to package directions. When the chicken is done remove from oven sprinkle with salt and pepper add the cheeses, bacon, and jalapenos to the top of the chicken. Turn the oven to 350 degrees F. Return the chicken to the oven and bake until the cheese is melted. It should take about 5-10 minutes. Pinned and on the to make list- thanks for sharing! What an ooey-gooey wonderful idea. Thanks for linking this to the party. A must make. Oh yes, please, these look amazing! Hope you are having a great day and thanks so much for sharing with Full Plate Thursday. Has football season written all over it. Pinned. This looks so yummy. Love all of the ingredients. Thanks for coming by and sharing at Foodie Fridays. Hope to see you again this week. These look incredible! 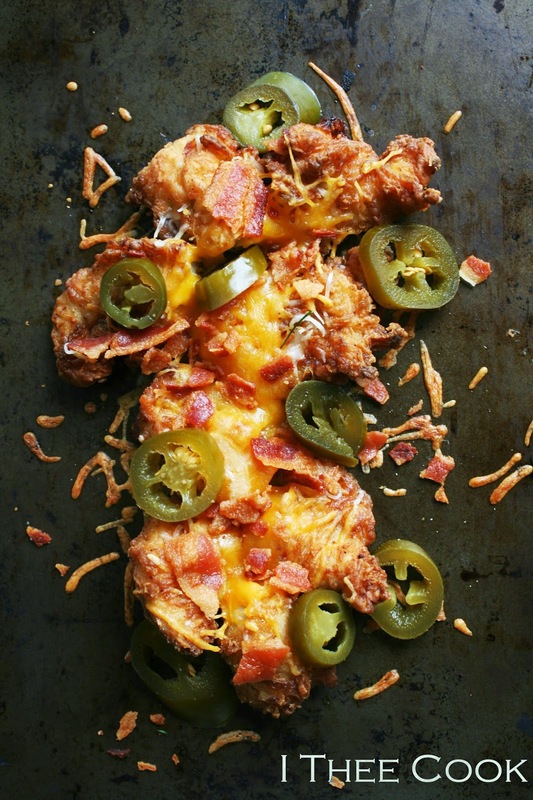 Bacon, jalapeño, cheese, chicken...what's not to love?! Thank you so much for linking up with us at Saturday Night Fever!